*It is highly recommended you wear a head lamp for the first few miles as it will be dark on single track trails. You may drop your head lamp at Folsom Point and retrieve at the Finish Drop Bag area. The American River 50 course has a single wave start, starting at 6:00 A.M. There will be NO early starts. American River 50 Mile Endurance Run begins at beautiful Folsom Point, at Folsom Lake State Recreation Area in the Sierra-Nevada Foothills. With Folsom Lake as the sparkling backdrop you'll traverse through oak woodland and meadows, over bridges and creeks, up and down switchbacks and along the most spectacular trails in the area. 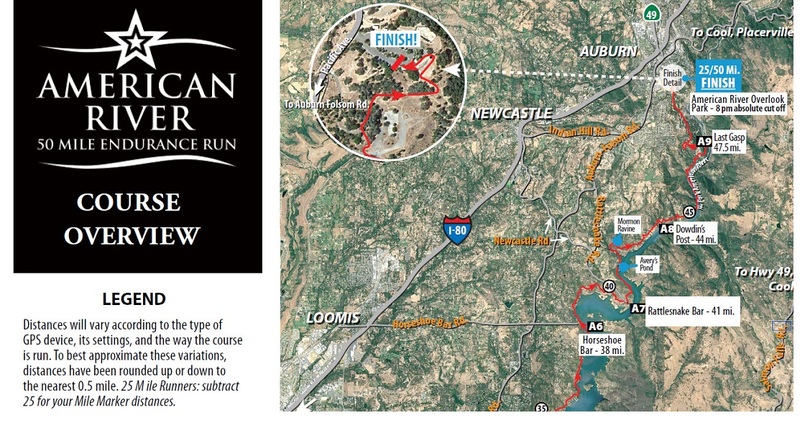 Runners will begin their 50 mile journey on single track trails and return to Folsom Point. At Folsom Point (Aid Station #1, mile 5), runners will make a loop on the service road and proceed past the park kiosk. At East Natoma Street runners turn right and continue west to the Folsom Lake Crossing. The course then heads South on the American River Parkway past the historic Walker and Rainbow Bridges. Runners then turn right onto the Lake Natoma Crossing Bridge access path. After crossing Lake Natoma the course remains on the south side of Lake Natoma on the American River Parkway through Willow Creek (Aid Station #2, mile 13) and then to the Sacramento State University Aquatic Center. After the Aquatic Center, the course traverses across the Hazel Street Bridge, makes a short climb to the River Access Road, then goes back down for a brief stint on the American River Bike Trail. Upon leaving Beal's Point at mile 25, runners will enjoy single track trails and head north to the path worn by gold miners in search of riches: the Pioneer Express Trail that begins near the entrance of the Granite Bay State Park. Runners will cross the entrance road to the park and continue on the Pioneer Express Trail to the Granite Bay Horse Assembly area (Aid Station #5, mile 29.5). Stock up here! The distance to the next aid station is 8.5 miles. After exiting the Horse Assembly, the route continues north toward Twin Rocks Rd. Just before reaching Twin Rocks Rd., the route will veer right and ascend on the Granite Bay Multi-Use Trail, a single track trail loop, for about 2.25 miles. The course rejoins the Pioneer Express Trail just above the Beek’s Bight parking lot and continues along the North Fork of the American River to Buzzards Cove, Horseshoe Bar (Aid Station #6, mile 38) and Rattlesnake Bar (Aid Station #7, mile 41). No, we aren't talking about stopping at local pubs, but rather passing by the sand bars where miners would pan gold… so enjoy the aid stations! The route then continues along the river to the Power Plant, Avery's Pond and Dowdin's Post (Aid Station #8, Mile 44). After leaving Dowdin's Post, the trail wends its way to the infamous "Dam Wall." Runners will take a deep breath before climbing up to the “Party at Last Gasp” (Aid station #9, mile 47.5). The refreshing Popsicle Palace, motivational mile marker signs, cow bells and our energetic cheerleaders will boost your spirits as you tackle the last climb of your final 2.5 victory miles to the well-deserved finish celebration in Auburn. You must pre-register for the bus. Option 1 - BEST CHOICE, HIGHLY ENCOURAGED BY RACE DIRECTOR/STAFF! Drive car to the finish at Overlook Park, Auburn. Free parking at Overlook, Railhead Park and on local streets. Buses leave at 4:10 a.m., taking runners to the start at Folsom Point in Folsom. For runners staying at partner hotels in Folsom, there is a complimentary shuttle to the start at Folsom Point at 4:15 a.m. There is no need to sign up for this service, just be in front of your hotel prior to 4:15 am. Be sure to check with the hotel for the departure point. For the return, those staying at the partner hotels in Folsom, the bus (Folsom Cordova District Busses) will depart from Overlook Park at 7:00 p.m., returning to same Folsom pick up points. If your expected finish time is later than 7:00 p.m. you must choose a different option. Have driver/crew/pacer drop you at the start, entrance to lot closes temporarily from 5:00 a.m. to 6:30 a.m.
*Crew can connect with runners at approved aid stations. *Entrance to the AR50 Race Start parking lot will be temporarily closed from 5:00 a.m. to 6:30 a.m. on race morning. IT IS HALF OF A MILE RUN IN FROM THE ENTRANCE IF YOU MISS THIS DEADLINE! **Buses do not return to aid stations – pacers must make own arrangements to return to their vehicles. REMINDER - Absolutely NO PARKING AT AR50 RACE START!! There is absolutely no room for any runners/crew/family/friends to park at the start of AR50. All cars will be turned around at the Kiosk (the drop off point of the runners and busses) and will be required to the leave the race start area. The gate at the top of the park, just off of East Natoma Street, will be closed at 5AM and any runners not already in the park will be required to be dropped off at the entrance to the park. Drive car to the finish and park at Auburn Fairgrounds (located at the intersection of Auburn-Folsom Blvd and Sacramento Street. The entrance is behind 7-Eleven at 303 Sacramento Street in Auburn, near the Overlook Park). Free parking at Overlook, Railhead Park, Auburn Fairgrounds and on local streets. Buses leave at 5:30 a.m. the Fairground Parking lot, not the Overlook, taking runners to the start at Beals Point. IF YOU NEED TO CHANGE YOUR BUS STATUS, EMAIL STAFF@NORCALULTRAS.COM.